There’s this collation tool online called Juxta. It allows you to compare two documents, and it highlights the differences between them in at least two ways. First, it shows both documents side by side, highlighting differences and drawing diagonal lines showing how pieces of the text have shifted. 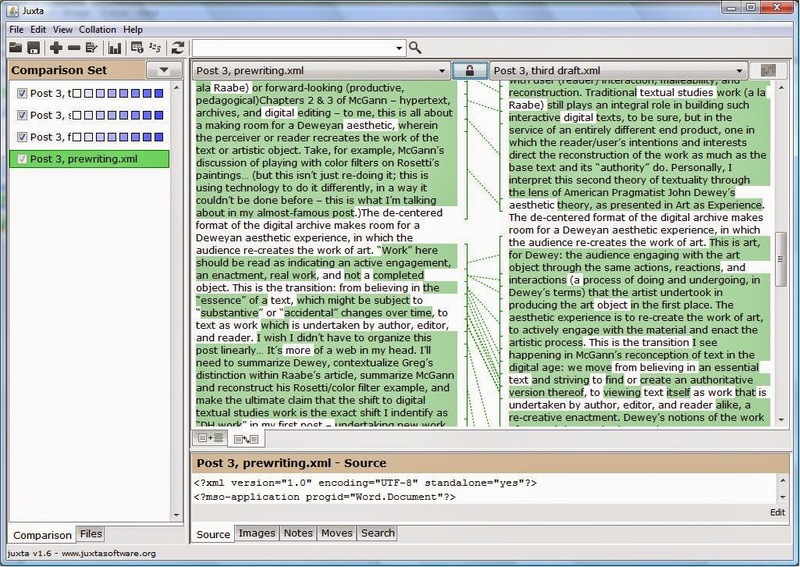 Second, it creates a heat map on just a single document, showing by lighter and darker shades of highlighting how different this document is from the other(s). 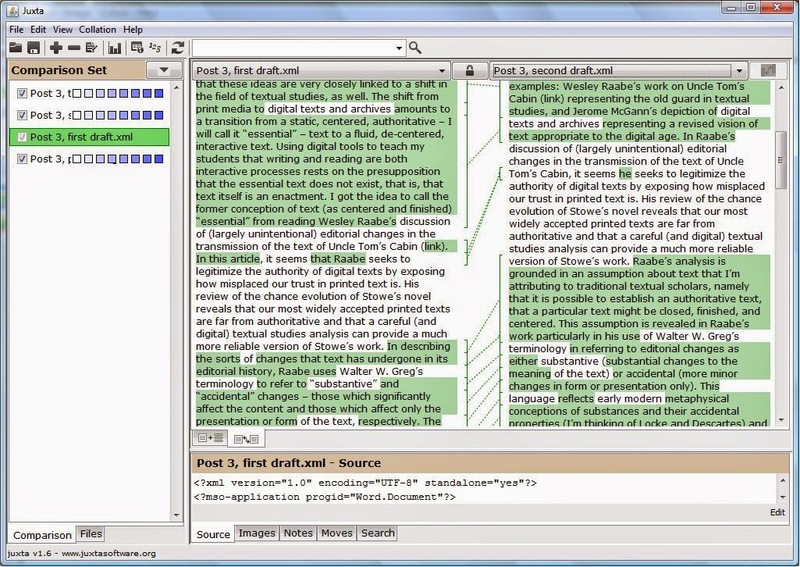 But I propose another use for collation software like Juxta: it can be used to learn about revision. Instead of comparing two printings of the same book, why not compare two drafts of the same student paper? That kind of collation could be useful for writers who wish to reflect on their process and consultants who want to model revision for their clients. Like Whitman with revising, I am a compulsive saver of drafts, so I had a few of my own on which I could test this idea. Let me show you what I found in visually comparing my own drafts, and then I’ll indicate how I think this tool could be used in a consultation. Figure 1: Comparing 1st and 2nd drafts. Figure 2: Comparing 2nd and final drafts. But when I compared my final draft with my prewriting document, into which I had just dumped the contents of my mind before even starting to organize, the value of visualization tools like Juxta jumped off the page (the screen) at me. One sentence had remained unchanged (so it's shown in white) from prewriting to final draft. (See Figure 3.) That was my thesis. Figure 3: Comparing prewriting and final draft. The heat map feature was just as revealing. A heat map of my prewriting document (comparing this text with all three drafts) was mostly dark, dark blue, meaning that almost all of it had changed, and drastically. (See Figure 4.) The heat map of my final draft, on the other hand, showed a variety of shades; elements of that document came from each of the previous drafts. (See Figure 5.) What stood out to me here were the words that were the lightest blue. There were just a few words here and there that had escaped the chopping block from beginning to end. These were my key words, so to speak. These were the words that gave my ideas continuity. This is a powerful tool for helping the writers we work with become more reflective and intentional in their process. I could imagine using Juxta in a consultation with a writer who feels stuck. Comparing recent drafts of her current project or visualizing the whole start-to-finish process of a past project can stimulate reflection on how her work has developed and spark new ideas for how to proceed. Identifying key words and sentences like I did could also show our clients the themes in what they’ve already written and help them refocus as they continue to write. Even screenshots like these, of someone else’s writing, can be used to model for our clients what the revision process might look like. We can broaden our reach (to embrace visual learners, for instance) and innovate our consulting by using digital visualization tools like Juxta. Check out the online version, juxtacommons.org, to take a look at your own revision process! This could be a really powerful tool for research into the writing process, too.